Owning a B&B requires a surprisingly wide skillset. Sure, you’ve got to be able to make breakfast (and beds), but apart from the other myriad of jobs including marketing, accountancy, technology, gardening etc, you’ve also got to be pretty handy when it comes to DIY. The constant use of your home, bedrooms and bathrooms mean they’ll start to show their age pretty quickly if you’re not repairing, refreshing or replacing them on a regular basis. OK, you can pay a tradesman to do that all for you but given the prices some of these guys (and gals) charge, the cost soon mounts up. Ergo, the typical B&Ber also becomes a pretty proficient DIYer too. We say proficient of course, but that’s not always the best description, as we’re about to demonstrate, although I think it’s fair to say that even the most expert tradesman is likely to make mistakes on occasion. Just ask the plumber who put our heating system in and forgot to cap off a pipe in the loft before filling the system! Having installed the funky triple shower valve and pressure tested everything to make sure nothing leaked, I was feeling extremely pleased with myself. This feeling of pleasure proved to be somewhat premature however. 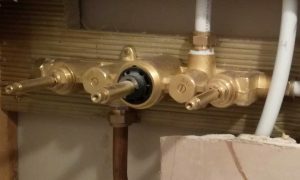 Those of you with a plumbing bent will note from the photo below, that the thermostatic valve (the middle one) doesn’t yet have its securing collar fitted. Those of you without a plumbing bent will notice a big brass thing with some spindles sticking out of it. That evening, as I sat in front of the PC, using another of my myriad of skills (looking at cute kittens on Facebook) I heard what can only be described as someone flushing the toilet upstairs. This might not sound surprising to you, but I knew we didn’t have any guests staying and I also knew Helen was in the shower, scrubbing up after a hard days DIY. It probably took all of about 25 Nano seconds for my brain to work out that spending all day doing plumbing, followed by the unexpected sound of a large amount of water going somewhere wasn’t a good thing. Instinctively, I leapt up from the cute kitty mewing on my screen, and dashed upstairs, only to be met by a scene that was initially quite hard to understand. On one side of the ensuite was the wall containing the shower valve, spewing out a zillion gallons of water, and on the opposite side of the ensuite was the other wall, where the spewing water was bouncing off. Given that I’d also taken up the floor to access the shower tray drain (which wasn’t connected), the resultant cascade was disappearing down under the floor, like someone had pulled the plug out of a bath! Luckily the prehistoric part of my brain instinctively shoved my hand over the 3 inch hole from where the thermostatic valve had magically disappeared, in an attempt to stem the flow. This mostly worked, as long as I didn’t move a muscle and pressed my hand as hard as I physically could against the pressure of the water trying to leave the valve. At this point I thought “OK, great. Now what?” as water dripped off both walls and swirled around my now, very wet socked feet. Luckily, I had my phone in my pocket, so preceded to dial the house phone with my one free hand, even though the movement of retrieving my phone allowed large jets of water to spurt from between the fingers of my other hand. Meanwhile, downstairs, Helen was wondering why I wasn’t answering the phone, when I was last seen sitting right next to it. A large number of seconds passed before she stopped drying herself from her recent shower, wrapped one towel around her body and another around her head, in that twirly whirly turban way that only women can master, and picked up the phone. Upstairs, Helen’s somewhat irritated voice echoed from my phone, but before she could finish berating me for not answering the phone, I demanded she bring the Vax up to the ensuite as soon as possible. There were two main problems with this request. Firstly, Helen’s version of asap meant, only when she’d finished drying and beautifying herself and secondly, the water-sucking VAX was brand new and was still in the box, which meant extracting it from a million square meters of polystyrene foam and associated plastic packaging. Some minutes later Helen arrived, still wearing her towel ensemble, carrying the freshly unpacked VAX and a bunch of plastic accessories which didn’t appear to be of any use unless you wanted to remove water from strangely shaped orifices. After fumbling with the VAX for a further few minutes, and getting nowhere particularly helpful, I decided it was much more urgent to relieve the pressure on my aching arm by turning off the shower water supply taps, located at the far end of the loft. As I knew exactly where the supply taps were, it was decided that I should dash up to the loft and turn them off. Clearly this meant Helen would have to put her hand over the hole to prevent water cascading out and joining the other zillion gallons that had already gurgled off somewhere under the floorboards. Somewhat optimistically, we attempted a choreographed removal of my hand, followed seamlessly by Helen plugging the hole with hers. The first part went really well as I removed my hand, exactly as planned. That’s when things went downhill somewhat. It wasn’t so much that Helen didn’t shove her hand over the hole immediately, but the half second delay allowed the full force of the water to burst forth, soaking us both before joining the river we’d already created. Helen bravely struggled against the water, but it continued to spray in all directions between the fingers of her small and dainty hand. Fortunately I observed her lack of success before I dashed up to the loft so I removed her hand (followed by another torrent) and shoved mine back where it had been previously. At this point I was getting physically exhausted from pressing against the force of the water so requested (ok, ordered) Helen to get into the loft and turn off the effing water! “I just need to get dressed first” she shouted, to which I suggested that wandering downstairs whilst I waited for her to dry her hair, find something to wear then wander back up again was probably going to take a tad too long. In response to my calm and reasonable questioning, she marched out of the ensuite in her towels, which were by now looking slightly less mystical, and attempted to get into the loft. The first thing you should know about the loft, is that the hatch and ladder were put in by me. This means I am fully conversant with its little foibles. Helen unfortunately isn’t au fait with the ladder that drops down and tries to smash you in the head when you open the hatch, nor the latch mechanism that stabs you in the back when you’re climbing the ladder, if you don’t put it in exactly the right position. As such, by the time she’d managed to get into the loft, she’d barely escaped from being rendered unconscious by the ladder, but had been gouged in the back by the latch, which also removed the towel covering her modesty. The twirly whirly turban towel still remained intact on her head though! After a small amount of naked stomping around Helen yelled something unintelligible down to me in the ensuite. “I’VE TURNED THE WATER OFF! she bellowed. Her next reply I did hear. “I’VE TURNED THE EFFING WATER OFF. STOP SHOUTING AT ME BECAUSE I CAN’T HEAR YOU. I’VE GOT A TOWEL ON MY HEAD!! I have to admit I felt a small amount of joy on removing my hand from the shower valve, even though I was left with a nice circular imprint of it in the centre of my palm. As I stood there, surrounded by the drip, drip of water, Helen disappeared downstairs. Again my joy was somewhat short-lived as the fire alarm went off, deafening me with its incessant wailing. Meanwhile Helen was downstairs discovering where all the water had gone. As I already had the buckets upstairs she was armed with various bowls, cups and other inappropriate vessels attempting to catch the multiple columns of water emerging through the ceiling from the ensuite above. There was a particularly large column emerging from the main light (which as still on), various smaller ones coming from invisible holes in the ceiling and another larger one coming out the bottom of the smoke detector, which is connected to the fire alarm! The fact that all this happened the day after we’d painted said ceiling, and that all our worldly goods were piled below the emerging water because we were also having the carpets replaced means that I may just remember to fit the retaining collar on shower valves in future.